Grip Studs - ATV tire studs for ice, snow, and mud. Works great on submerged logs in wet areas. Want to get more traction and a better edge while riding? Then Get a Grip with DF Corps NEW Grip Studs. Choose from a number of different stud sizes depending on you application and needs. These super hard, corrosion resistant studs are made with tungsten carbide, which is three times stiffer than steel, and will give you the strength and grip you need no matter the terrain. Great for mud, snow, ice, trail riding, etc. The easy to install self-tapping studs simply screw into the tire knobs and are ready to ride. 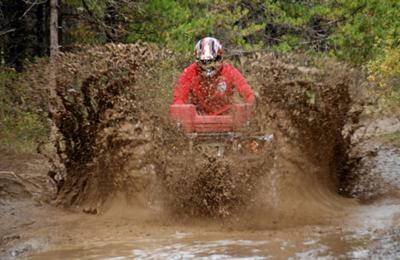 World of ATVs comment: This looks like a great new product. IF you've ever seen the way sheet metal screws can rip up the lugs on an ATV tire, you can appreciate a dedicated tire stud like this. We just might have some old block pattern turf tires laying around to experiment with and see how these new studs work. Our riding area includes a lot of submerged logs and underbrush, so it would be interesting to see if these ATV tire studs helped with traction on those. Comments for Grip Studs - ATV tire studs for ice, snow, and mud. Grip Studs are an excellent traction increasing option! They provide a lot of grip and have a much longer life time and higher stud retention level than the typical screw design. Since these are made for ATV tires they will work a lot better than sheet metal screws. Return to New ATV Parts-Accessories.